This year I’m running two garden tours for the City of Darebin – for everyone who has been asking when I’m next opening my garden to the public, well, it’s that time of the year once again! The festival is being held from Saturday 19 – Sunday 27 November, 2016 on weekends and early evenings during the week. 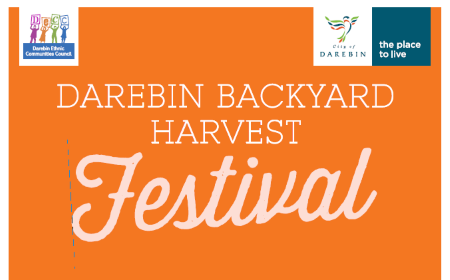 Now in its sixth year, Darebin’s ever popular Backyard Harvest Festival is presented by Darebin City Council in partnership with Darebin Ethnic Communities Council. The November festival celebrates Spring planting, inspiring home gardeners of all ages, skill levels and cultural backgrounds to sow their favourite herbs, vegetables and fruit for the summer harvest. There is also an Autumn Backyard Harvest festival held as part of the Homemade Food and Wine Festival each May. This festival is all about local residents sharing skills and knowledge on growing fresh food at home. Many families and cultural groups have been cultivating abundant food gardens in Darebin for years, and this festival showcases and celebrates their achievements. Previous festival goers have said they made new gardening friends and felt very inspired to give food gardening a go. They loved the cross-generational, cross cultural sharing of gardening and food preparation skills. There are 16 different home gardens and 7 workshops in this years program, covering everything from water efficient gardens, fruit tree grafting, to keeping chooks and quails. Angelo is a sustainable gardening and permaculture presenter, trainer and writer and passionate food forest advocate. His garden won a Darebin Sustainability Award in 2012, and was featured in the prestigious Open Gardens Australia event in 2014 and 2015. Angelo’s high density food forest garden produces a huge diversity of food – stone fruits, berries, herbs and vegetables. What appears to be a verdant tumble of vegetation is actually strategic placement to create synergistic relationships and enhance the microclimate and growing conditions for each plant. This is also an effective pest control technique resulting in a wonderfully abundant organic garden. Passionate food forest advocate Angelo Eliades from Deep Green Permaculture will demonstrate how a conventional backyard has been transformed into a thriving, productive biodiverse demonstration permaculture food forest garden with over 30 fruit trees, dozens of berries, multitudes of medicinal herbs as well as plenty of exotic edibles from around the world and native bush food plants too. This entry was posted in Upcoming Events and tagged Darebin Backyard Harvest Festival 2016, garden tour. Bookmark the permalink. Please check with the Darebin council contact listed here, it should be open to everyone! I’m doomed! Couldn’t get to your course at BAAG talk, and today I tried to book to see your garden, but it’s booked out! I’d love to come and see it sometime too. Hi Liz, if I have the time I might have to schedule my own extra open garden event for the people who missed out. I’ll advertise it in ‘Upcoming Events’. At hat would just fantastic! Thanks! I would also love to come and see your garden but was unable to get a booking. I would also like to find out where to purchase some of the plants mentioned in the video on youTube.